No. 17, Jalan Selampit 21, Taman Klang Jaya, 41200 Klang, Selangor, Malaysia. 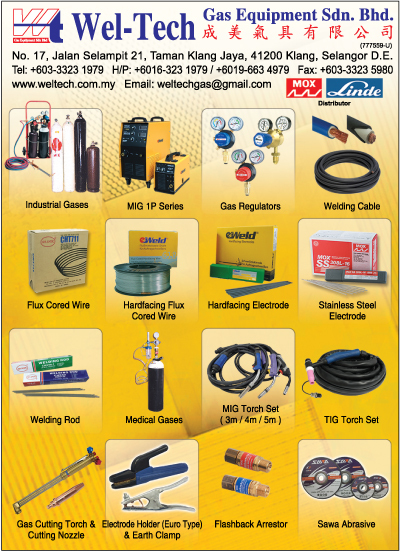 Wel-Tech Gas Equipment with its based in Klang, Selangor, started business some 20 years ago as a distributor in industrial, medical & speciality gases with Malaysian Oxygen Berhad (MOX) . 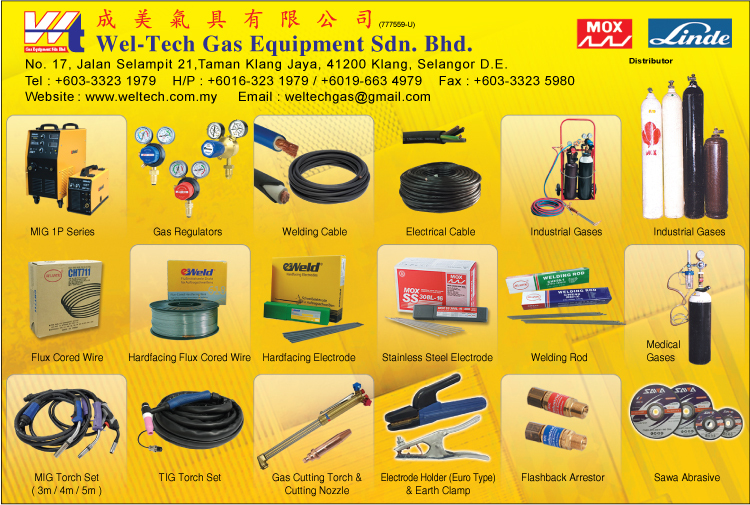 Apart from gases, Wel-Tech is also one of MOX's premier distributor for welding products like electrodes, welding wires & gas equipments, representing brands like BOC, Matador, MS6013 & Speedcore. Wel-Tech has since grown to a group of companies involving in the import & distribution of a wide range of welding, cutting & industrial products. The group has also expanded its' based of business from Klang Valley to across the country, with dealers at both east & west Malaysia. Lead by a dynamic & aggressive management team, the group continues to grow and expand, meeting the needs of the industry and market.